Whatever your position on the Eurozone crisis it is an important day for Ireland. Today the country returns to being a democratic sovereign state after three years during which power was held by unaccountable technocrats working in the interests of global finance. The fact that Ireland can once again borrow in the finance markets is being heralded as a success for austerity, but that rather depends on your perspective. 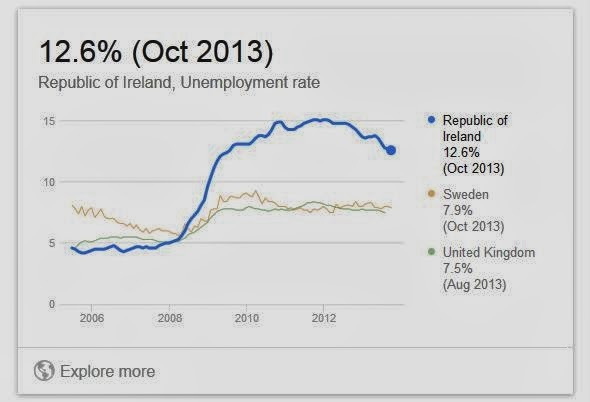 If Ireland's problem was that it had borrowed excessively then this has certainly not been solved. The country's debt represents 124% of its GDP, meaning that its people are working harder to pay money to absent shareholders of foreign banks. The unemployment rate of 13.5% (see the graphic, left) is an artificially low figure because of the high rate of outward migration, a process that threatens the country's future by removing the most talented young people. Meanwhile cuts in a range of social benefits and government programmes will deepen and continue. We should also be questioning how Ireland found itself holding unpayable debts: what is its story as one victim of the msiguided Eurozone project. Because the single currency area required a uniform interest rate for countries in vastly different economic situations it was bound to destabilise particularly the smaller economies. In Ireland's case the low Euro interest rates provoked an absurdly euphoric boom in construction. The later bailout of the corrupt and disreputable Anglo-Irish Bank at a cost of €440bn was the final straw for the Irish economy, which became effectively bankrupt. The European authorities have decided to allow Ireland to keep its extremely low corporate tax rate, allowing it to generate cash to pay to its creditors. This means that we, as Ireland's economic neighbour, are also suffering as a result of the deal. US corporations, particularly those in the high-tech sector including Apple and Google, set up in Ireland where they are only required to pay 12.5% tax rather than in the UK. This also justifies George Osborne's decision to cut corporate tax rates here on the basis of the need for us to be competitive. While Ireland's time with the bailout programme has turned it into a beggar its route out of the crisis is also beggaring its neighbour. This sort of competition between countries should be cooperating for mutual benefit is an inevitable consequence of globalisation. It is the very system itself, with the free movement of capital and lax regulation of corporate activity, that is enabling capitalists and particularly financiers to benefit at the expense of the citizens of the world.